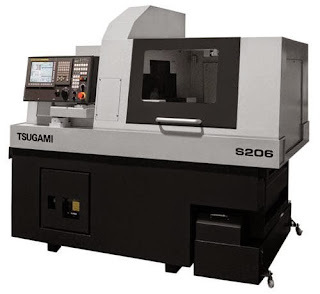 Lowell, Inc. Blog: Lowell adds another Tsugami S206! Lowell adds another Tsugami S206! We are adding another Tsugami S206 to our Swiss department! The 6 axis S206 has 12,000 RPM main and sub-spindles and 8,000 RPM live tooling that enables our operators to machine with both spindles simultaneously. A Fanuc 32i-A CNC controller, 35 tool capacity, bar feeder and chip conveyer round out the package. Lowell has invested over half a million dollars in the last 30 days for the Tsugami S206 and the Nakamura WT-100. We are committed to increasing our turning equipment to shorten lead times and boost capacity.